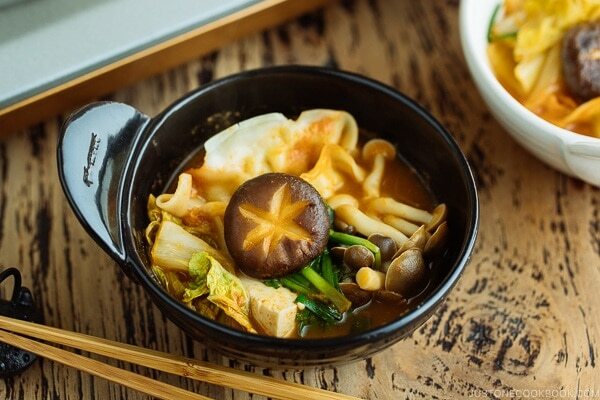 Kimchi Gyoza Nabe is a Japanese hot pot filled with succulent Japanese dumplings, spicy kimchi, tender vegetables, and hearty mushrooms. It’s a simmering bowl of savory deliciousness! 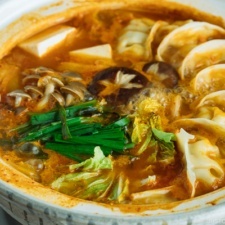 Kimchi Gyoza Nabe (キムチ餃子鍋) is a comfort dish filled with Japanese ingredients cooked in a Korean-inspired, spicy kimchi base. 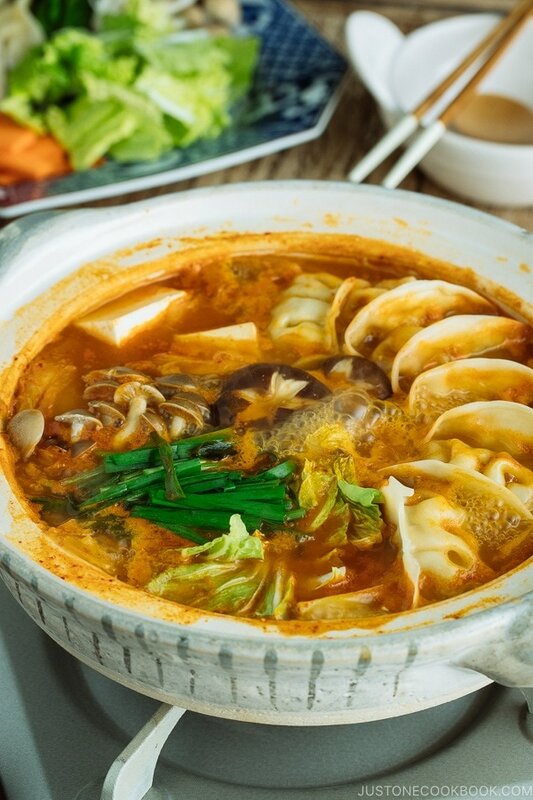 I love it since you can quickly throw in gyoza (Japanese dumplings), tofu, vegetables, and mushrooms to make this hot and sour soup. It is packed with flavor for a mouthwatering summer dish to go along with a glass of ice cold beer. And it’s perfect on a cool day when you need that satisfying kick of spice to warm you you up. In a nutshell, Gyoza Nabe (餃子鍋) is like a dumpling (wonton) soup, except the dumpling here is Japanese gyoza. If you search Gyoza Nabe in Japanese, there are many variations – with different types of soup broth and different hot pot ingredients. 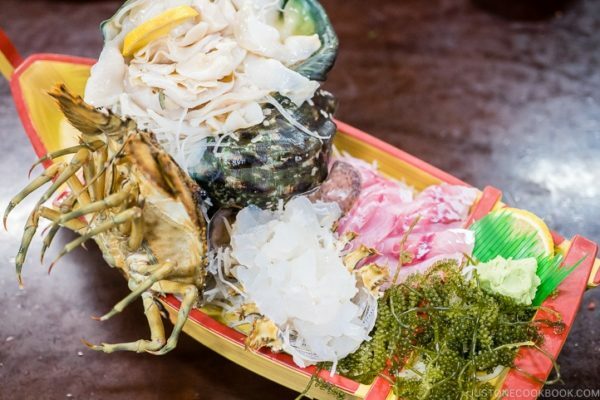 Since this dish is not considered “traditional” Japanese food, make it with your favorite Japanese ingredients! 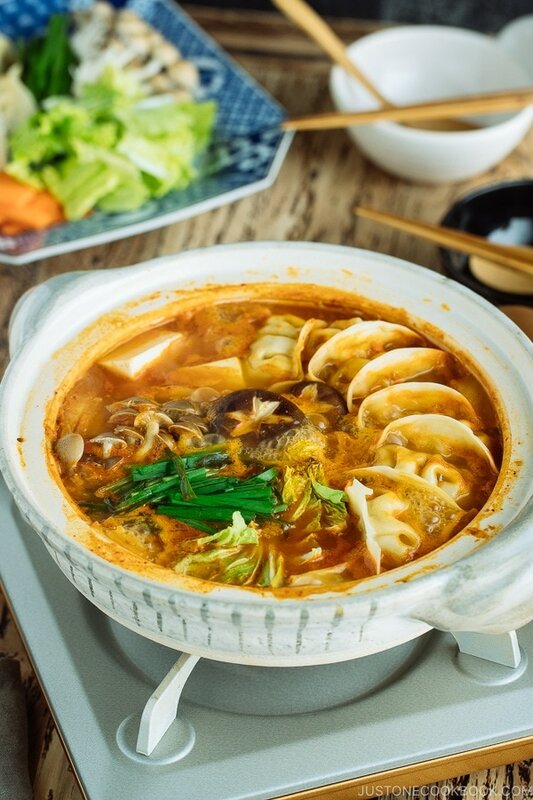 This Gyoza Nabe is totally my version that I came up with on a whim (but don’t worry, I have tested it a few times to make sure this recipe will absolutely hit the spot). 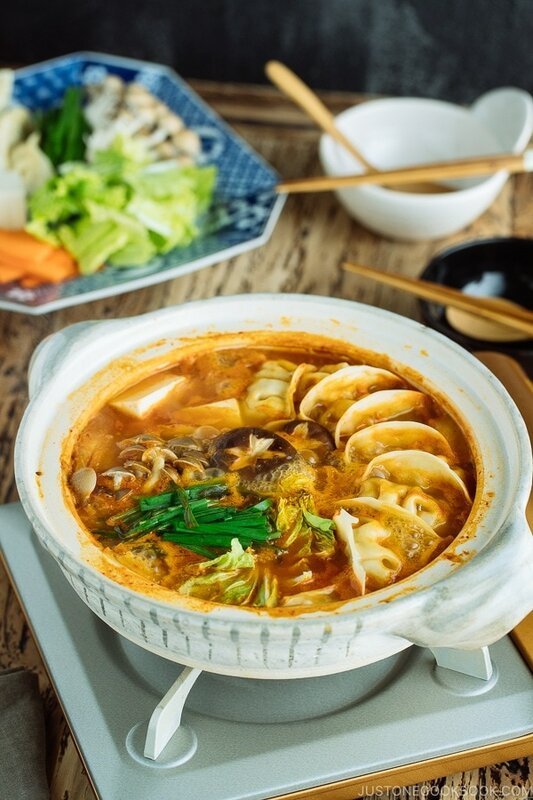 Instead of a simple clear broth commonly used in Japanese hot pot, my recipe features a delicious spicy broth that richly infuses its flavor into the savory ingredients. 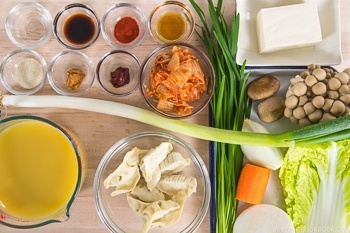 You can also make this Gyoza Nabe with a kimchi soup base, or try one of these variations that might be fun for you to discover. 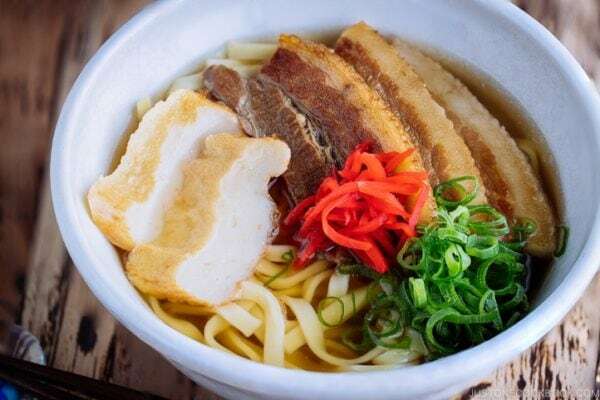 Ramen noodles or steamed rice for enjoying the flavorful leftover soup! 1. Always let the miso dissolve completely in a ladle rather than in the pot. When you work with miso in a soup dish, make sure to completely dissolve miso in a ladle first before releasing miso into the soup. If you drop miso paste in the big pot of soup, you won’t know if the miso has been completely dissolved. You may end up adding more miso thinking that the soup doesn’t have much taste. Also, each brand of miso has a different level of saltiness, so please always taste the soup and adjust the flavor according to your liking. 2. Cook the dense ingredients first, then leafy and soft ingredients. If you want to enjoy the hot pot with all the ingredients being cooked at the right texture, you have to cook in 2 separate stages. Throw in root vegetables first, and then add in leafy vegetables when dense ingredients are almost tender. This way both the leafy vegetable and root vegetables will retain their proper texture. Another tip is to cut the ingredients into similar thickness and size so they’ll take roughly the same amount of time to cook. 3. Cook Gyoza just the right amount of time. Whenever I make this, it’s a “fast food” recipe that I can make very quickly to feed my family. For me, I almost always use frozen gyoza – either homemade gyoza which I keep in the freezer or pre-made frozen gyoza from the grocery stores (Trader Joe’s has frozen pork or chicken gyoza which we like). You don’t need to defrost, just add the frozen gyoza in the hot soup. Remember to add gyoza when all the ingredients are almost cooked through. Don’t cook the gyoza too long as the gyoza skin gets soggy when it’s soaked in the soup for too long. The overcooked gyoza skin could break easily and its filling may slip out. End Your Kimchi Gyoza Nabe with Rice or Noodles! We enjoy the hot pot placed on the portable gas stove set at the dining table. It’s fun to eat and cook at the table as you can have a conversation with your family or friends while enjoying delicious food. For this recipe, there will be plenty of soup available for you to make it into a noodle soup by adding ramen noodles to the broth. 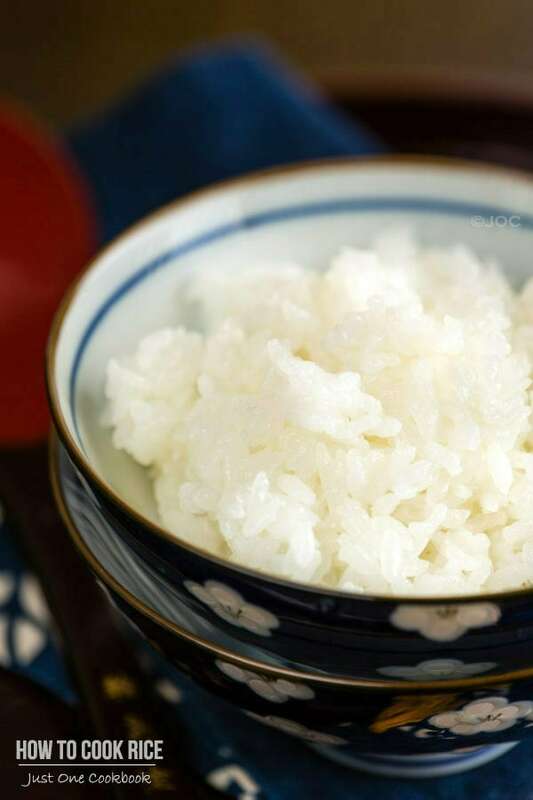 You can also add steamed rice to go with the spicy soup. If you don’t have donabe, Japanese earthenware pot, you can make this dish in a regular pot. So what are you waiting for? 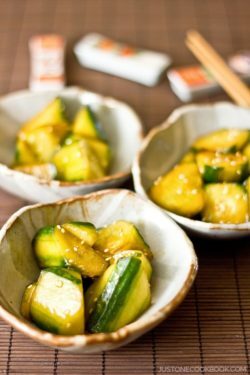 Simply chop the veggies and throw in gyoza and you’ll have a mouth-watering meal ready in 30-40 min from start to finish. You’ll be surprised by how easy it is to put together this scrumptious meal. Enjoy! Don’t want to miss a recipe? Sign up for the FREE Just One Cookbook newsletter delivered to your inbox! And stay in touch on Facebook, Pinterest, and Instagram for all the latest updates. 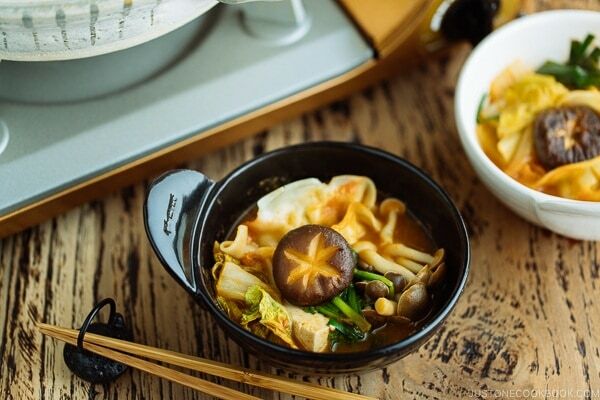 Kimchi Gyoza Nabe is a Japanese hot pot filled with succulent Japanese dumplings, spicy kimchi, tender vegetables, and hearty mushrooms. It's a simmering bowl of savory deliciousness! Cut ¼ onion into wedges and then cut them half. Cut the white part of negi (leek/green onion) diagonally. Cut the napa cabbage into small pieces. Cut the daikon into quarters lengthwise then thinly slice them. Cut the carrot into thin slabs and cut them in half. Cut the garlic chives into 2 inch pieces. Discard the bottom of the shimeji mushrooms and shiitake mushrooms. You can make a decorative shiitake mushroom following this method. Cut the tofu into roughly 1.5 inch cubes (it’s harder to fish out from the hot pot if you cut too small). Heat the sesame oil in a hot pot over medium heat. Add the onion and cook until it’s coated with the oil. Add the kimchi and stir fry with the onion and Tokyo negi. Add gochugaru and granulated sugar. Mix all together well. Add 4 cups chicken stock, and cover the lid to bring to simmer. Once simmering, lower the heat to medium low heat. Add soy sauce and miso. 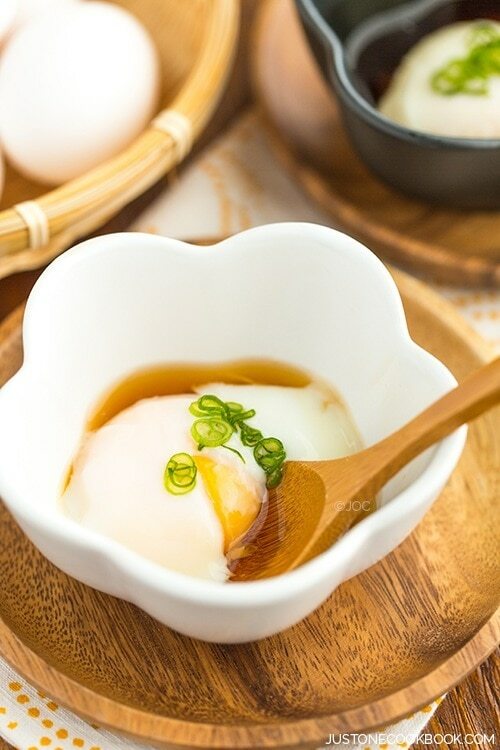 It’s best to put miso and small amount of soup in a ladle and let it dissolved first instead of dropping miso in a pot and not sure if it has been dissolved completely. Taste the soup and adjust the taste by adding salt (I added ¼ to ½ tsp), if necessary. Add the hard vegetables to the soup first, such daikon, carrot, tough part of napa cabbages, etc. Cook covered for 10 minutes on low heat. Skim off the foam and fat. Add the soft ingredients such as leafy part of napa cabbages, mushrooms, and tofu. Add the gyoza (if frozen, no need to defrost) and garlic chives on top. Cook covered over medium low heat for 5 minutes. Serve the extra ingredients on a plate and add them once you finish the ingredients in the pot. Vegan Kimchi: You can make my friend Seonkyoung's recipe. Beautiful dish to serve to the family. This recipe looks so good. I have one clarifying question.. Can you confirm that the cabbage is 4-6 lbs (you left off the weight)? Huge and tasty fusion fun Japanese-style with Korean overtones. Like the soupy version of a Chinese stirfry which also makes one use one’s imagination 🙂 ! Absolutely love any meals cooked and eaten together whilst the music plays and conversation flows . . .
Don’t know about that occupational choice 🙂 ? When I make it to SF promise to come up and silently chop, chop, chop . . . !!! . . . . with love . . .
Wow! Never met a dumpling I didn’t like. 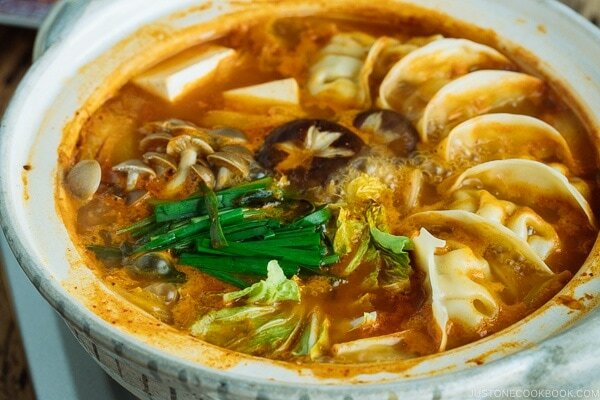 Never had a hot pot like this — so much flavor! Outstanding recipe — thanks. Tried this receipe and my family loved it! Especially its winter time and the spicy hearty soup kept us warm. Will be having it again soon and maybe add in thinly sliced pork belly and Korean rice cake. Just wanted to let you know – I have been making many of your recipes now for several months and have never been disappointed. Your attention to detail (I assume that is a Japanese trait) is astonishing and refreshing. It certainly helps this engineer to follow your recipes! Hi Elaine! Hope you enjoy this recipe! It’s easy and fulfilling, especially on cold days! Just made this! So delicious. I even made the gyoza and wrappers following your recipe. Not a scrap left and there were only three of us! Lol!!! I just made this for dinner last night! It was so delicious. The spice level was perfect and made it extra warming for a cold fall night. I currently only have a small donabe so I cut the recipe in half and then put some extra veggies and gyoza on a plate to add as we ate. It was actually quite a lot of food. It was enough for me and my partner to share for dinner with enough leftovers for my partner to take for lunch the next day. We will definitely be making this again! What a wonderful dish! Quick, easy, satisfying and delicious, What more could you ask for. I just found your site and have made a few dishes and all have been great. The site also includes great information regarding Asian food culture, which I love. thank you! I have a double lid rice cooker donabe I got from Toiro and am buying a classic style one as well. What size is yours? I’m not sure which size to buy to make recipes like this for the 4 of us. 10.5″ or even larger? Thanks so much! 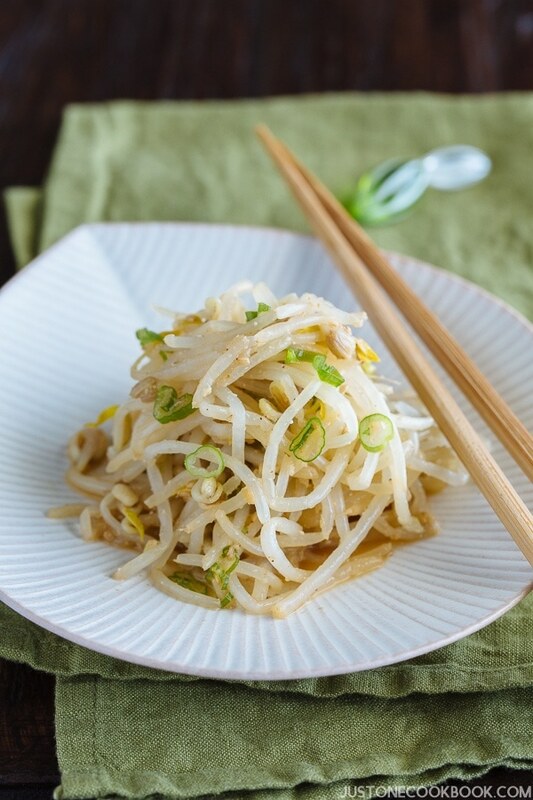 Hope you enjoy the recipe and cooking in donabe! Hi, what size of donabe do you use? Your donabe is so cute! What brand is it? Hi Christopher! I got it from Toiro when I was in Los Angeles. Mine is medium size: https://toirokitchen.com/collections/all/products/rikyu-tokusa. Quick question–do you have any recommendations for a grill I could use to keep my hot pot warm once it’s on the table? I have a clay pot without a lid. Will using a glass lid (I have one that fits the clay pot pretty well) rather than the traditional clay lid affect the quality of the food I cook? What kind of miso? Shiro? Aka?